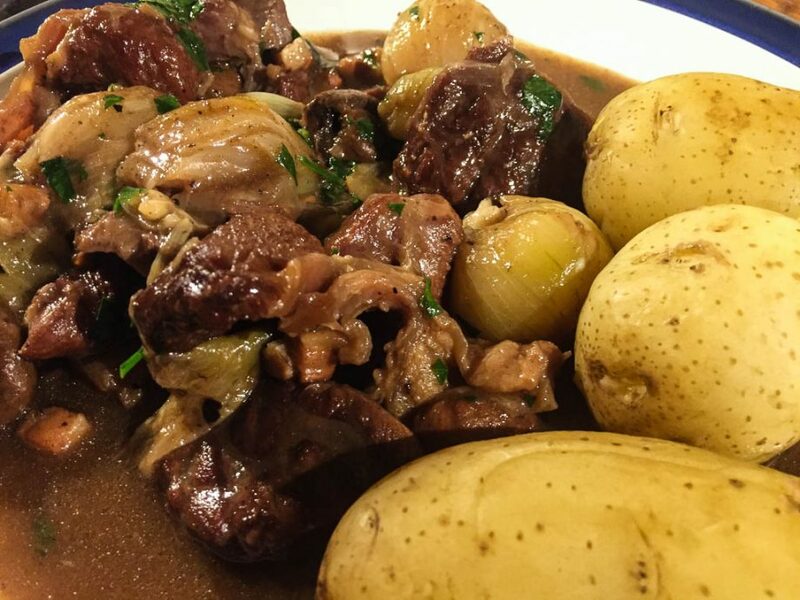 There’s nothing like a good beef stew, warming and hearty, and this recipe shows all the promise of being an excellent beef stew. 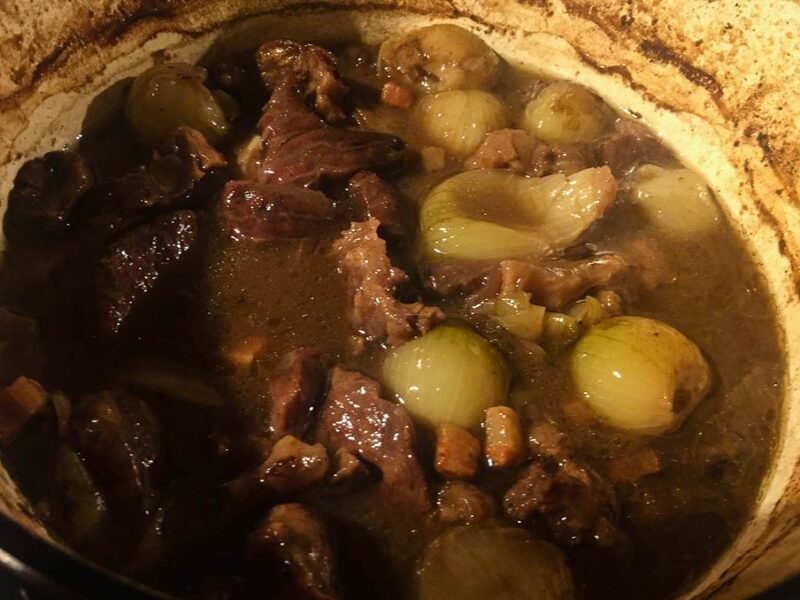 I’ve made variations on Boeuf à la Bourguignonne many times, but I can’t honestly remember if I’ve made this specific recipe. Well, now I’ll be sure. The recipe starts with the sauce. 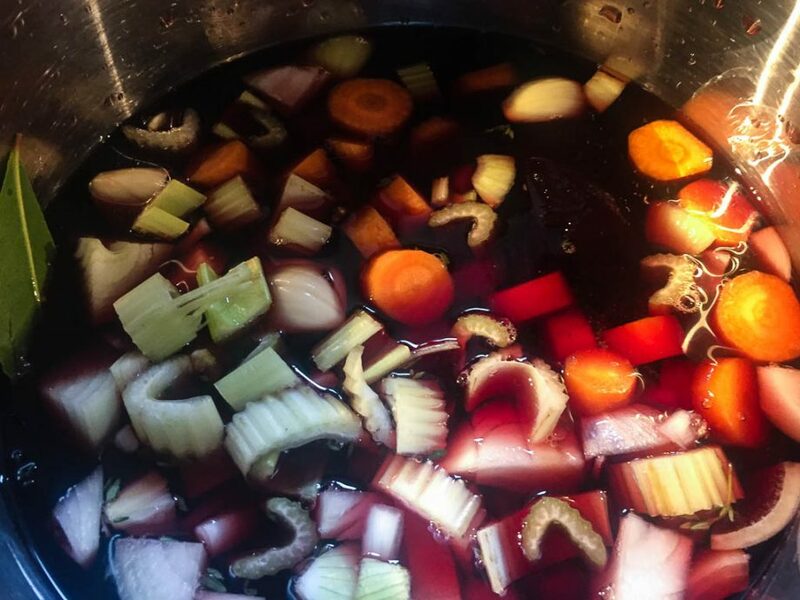 Onions, carrot, celery, garlic, herbs and redcurrant jelly go into a pan with a bottle of Burgundy and brought to the boil. Once boiling, I set fire to the pan and watch the flames dance about the surface for a minute or two until they die down. 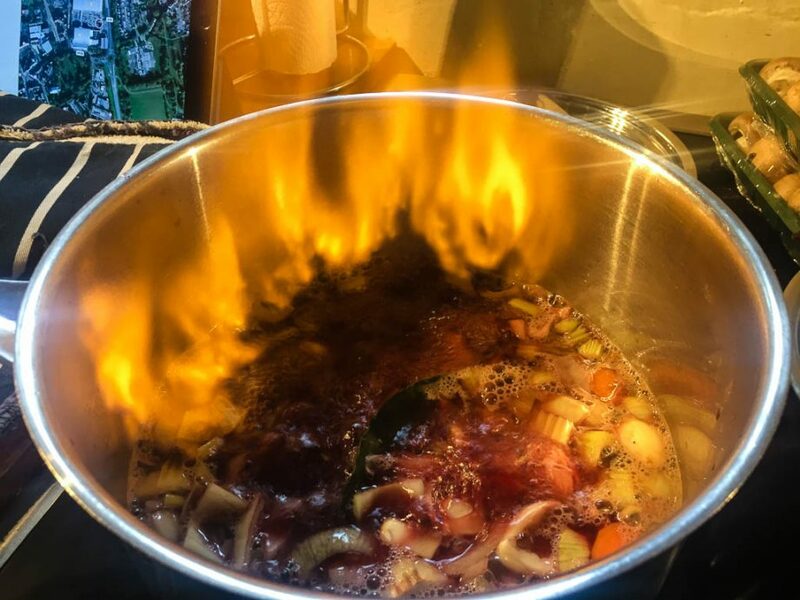 I set the pan at a slow simmer and leave while the wine reduces. 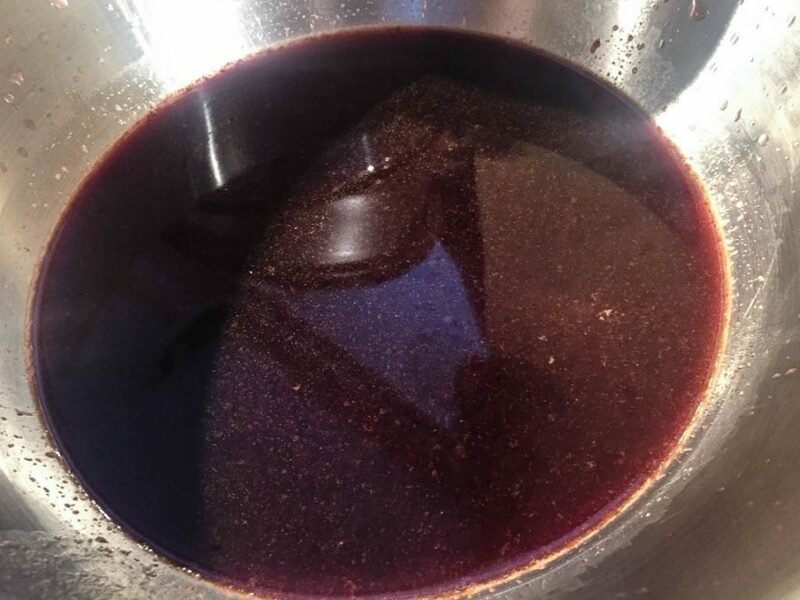 Once done, I strain the liquid and put to one side. While all that’s going on, I deal with the pigs trotter. 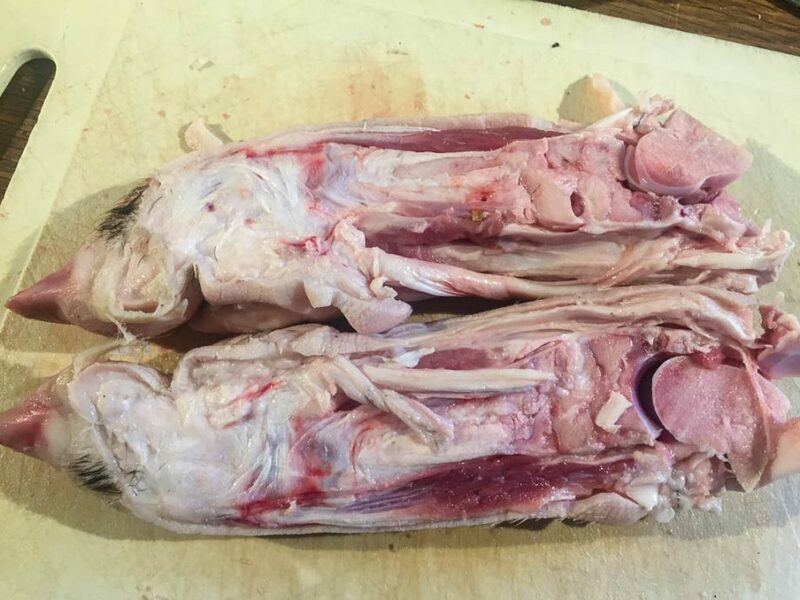 The only trouble is, the recipe calls for “1 pig’s trotter, split lengthways by the butcher”. I do have a pig’s trotter, but no handy butcher to split it for me. No problem, I can do it myself. I have a battered old knife that I keep around for heavy grunt work like this, so I bring it out. 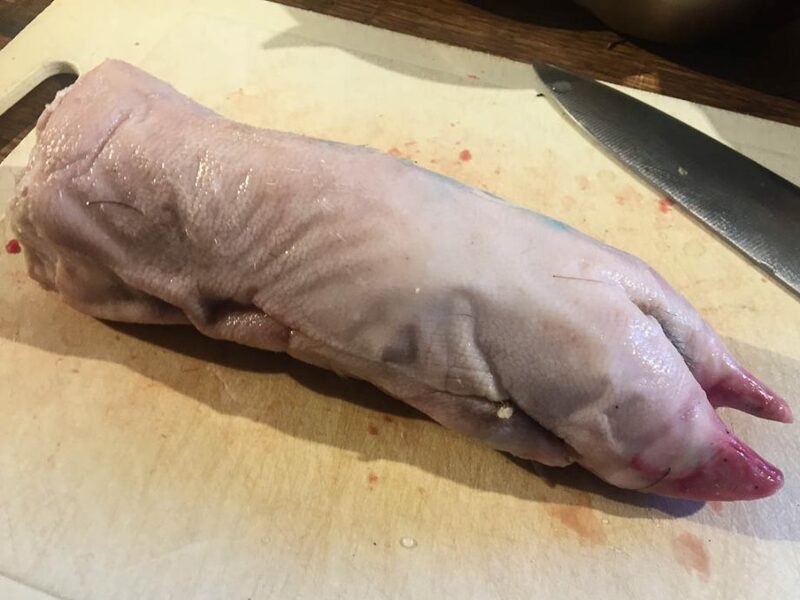 Do you have any idea how tough a pig’s trotter is? It’s like hacking through a solid piece of bone. It takes a solid five minutes of hammering to get through it, but after a monumental amount of effort, I manage it. 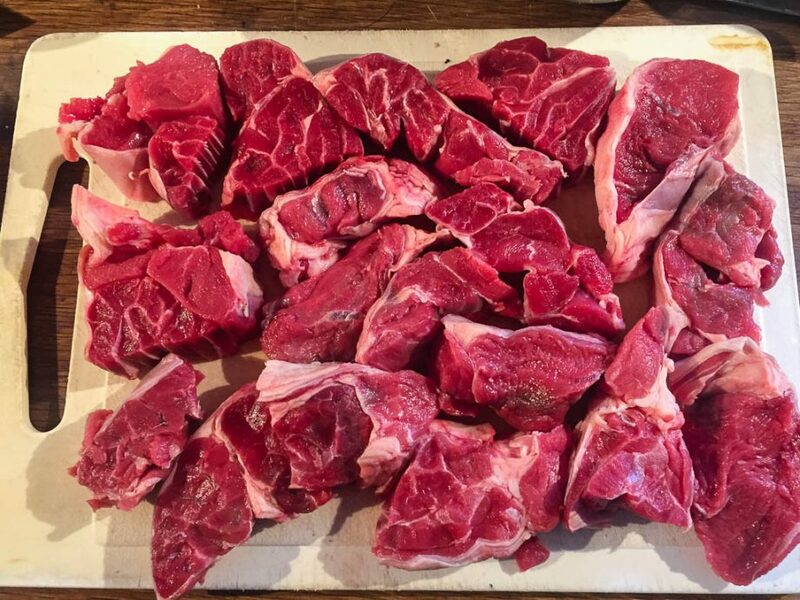 Next, I take some beef shin and cut into generous, large pieces. 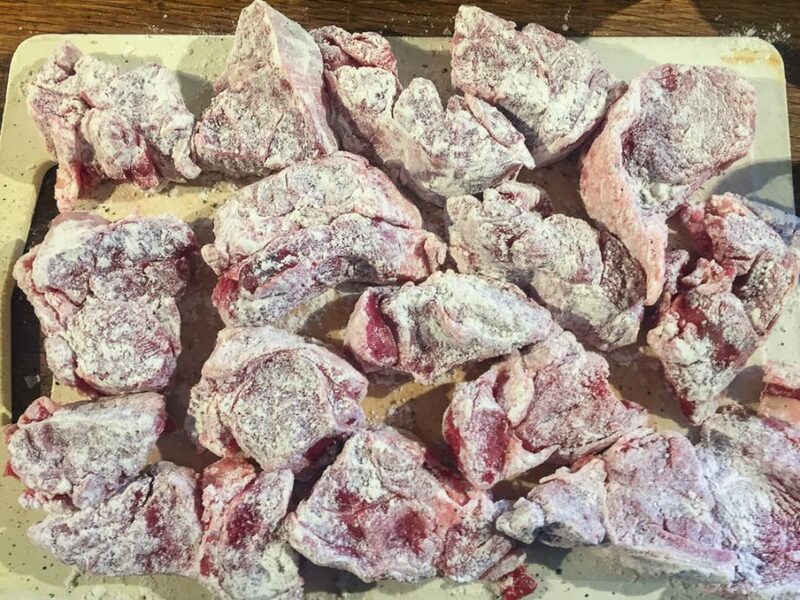 These get seasoned and dipped in flour. 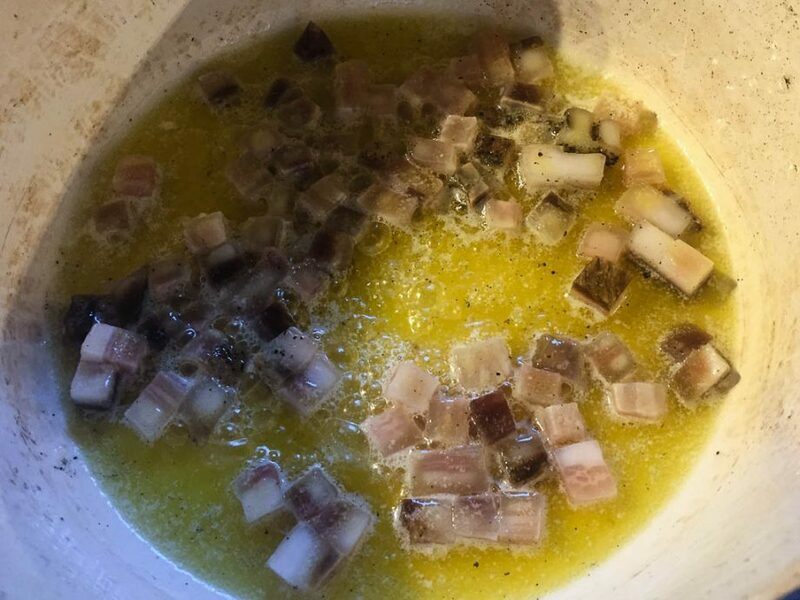 I melt oil and butter in a cast iron pot, and fry pancetta in it until crusted and brown. Then, as the recipe directs, I remove the pancetta to a plate and reserve. Now the beef goes in, cooking a few pieces at a time until well coloured on both sides. The onions are cooked in the same way. 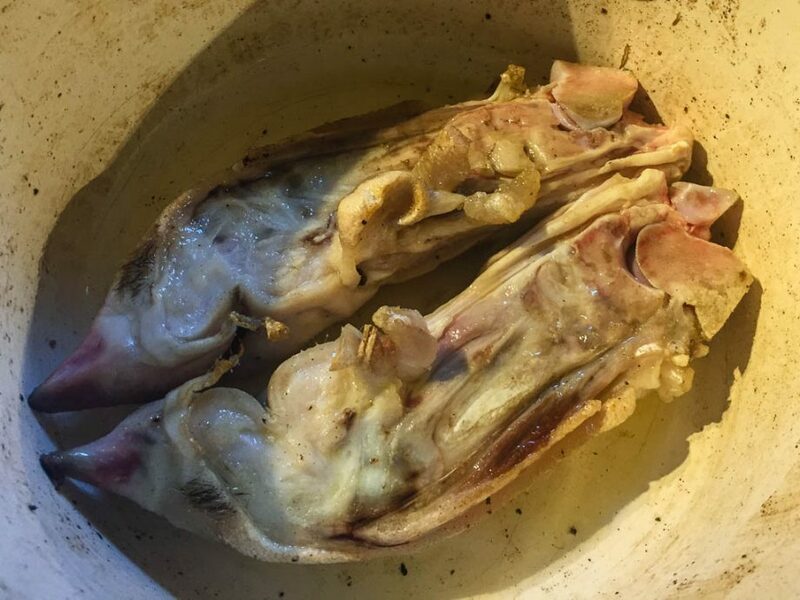 Finally the two halves of the trotter place in the pan and fried until they brown. Next, the instructions say “leaving the trotter in the pan, tip out everything else but the merest amount of fat”. But there is no fat. 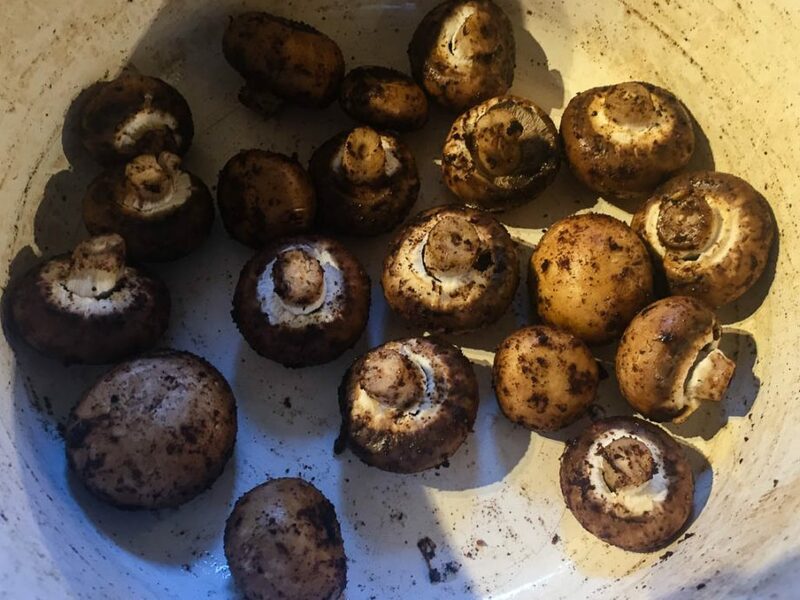 Those mushrooms sucked up every last dot, and very little then came out of the trotters. Oh well. I add the beef, onions and mushrooms back to the pan, and check to see if I need to add the pancetta too. It doesn’t say to add it, so I read on to find out what to do with it. 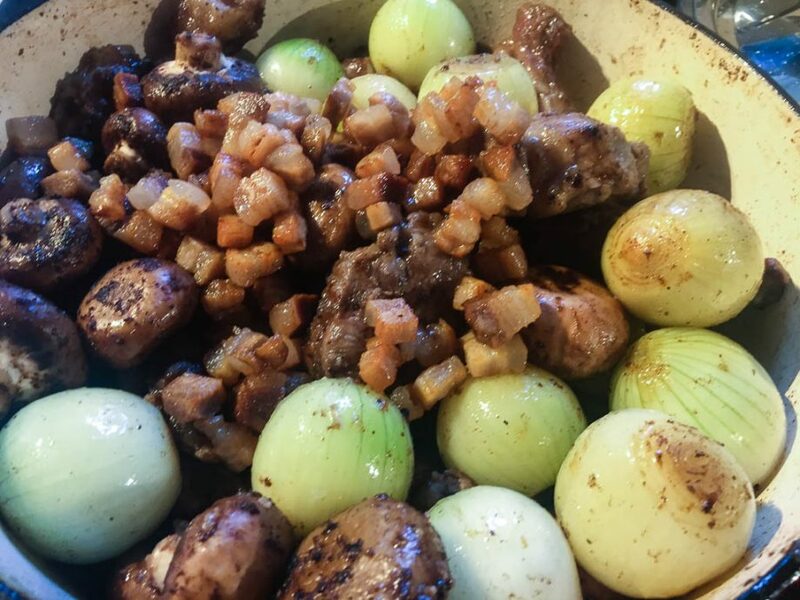 There is no further reference to pancetta in the recipe. The instructions clearly tell me to “reserve it”, but not what I’m reserving it for. I ponder for a moment. Is it simply a mistake, and the instruction is missing, or am I really supposed to now discard the now crispy nuggets of tastiness? Should I add the pancetta when it’s not supposed to be there, or should I assume it’s a simple omission in the recipe and add it. In the end, I decide that extra flavour is a better option than missing flavour, so I throw it in the pot. I turn up the heat and pour in cognac, for a second burst of fire. I like this recipe. Finally, I add the wine and bring it to a simmer. The book warns that there will not look to be enough liquid in the pot. It is right to do so, but I trust it is correct when it says that more will come out of the meat and vegetables as it cooks. I put the pot into the oven and cook for a couple of hours. When it comes out of the oven, it looks and smells delicious. I remove the trotter, check the seasoning, add some lemon juice and sprinkle with parsley. I serve it with some plain, boiled potatoes. It is excellent. Large chunks of beef covered with dark, richly flavoured sauce. The slight sweetness of the onions, and the savoury bite of the mushroom accompany the meat beautifully. This is possibly one of the best beef stews I have ever made. I admit to thinking this wasn’t going to be very nice earlier in the day when Dave had it out of the oven to adjust and stir. It had very little aroma coming off it. 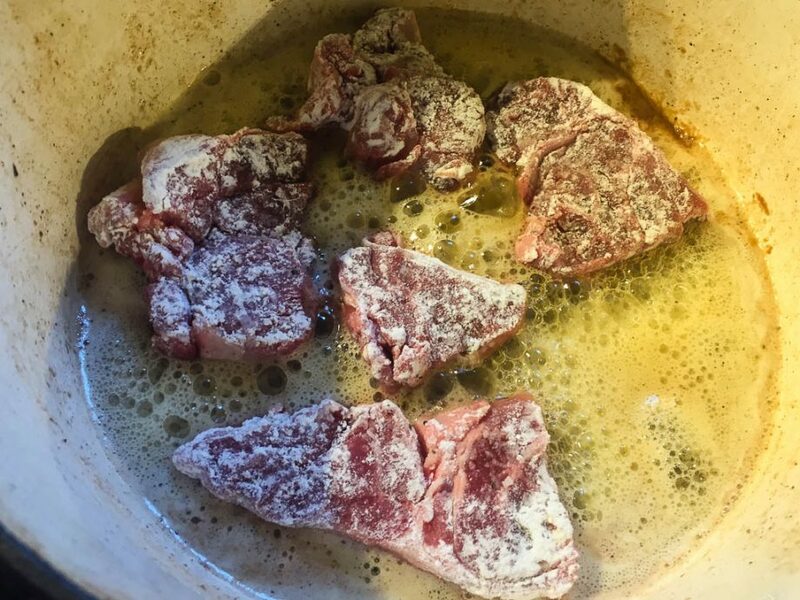 And what little there was did not smell like a rich, beef and red wine dish. I was hungry but not actually looking forward to it. Plus, I’d seen the pig’s foot in it, which seemed very odd to me. Anyway, dinner time arrived and this time when the lid came off it smelt lovely. 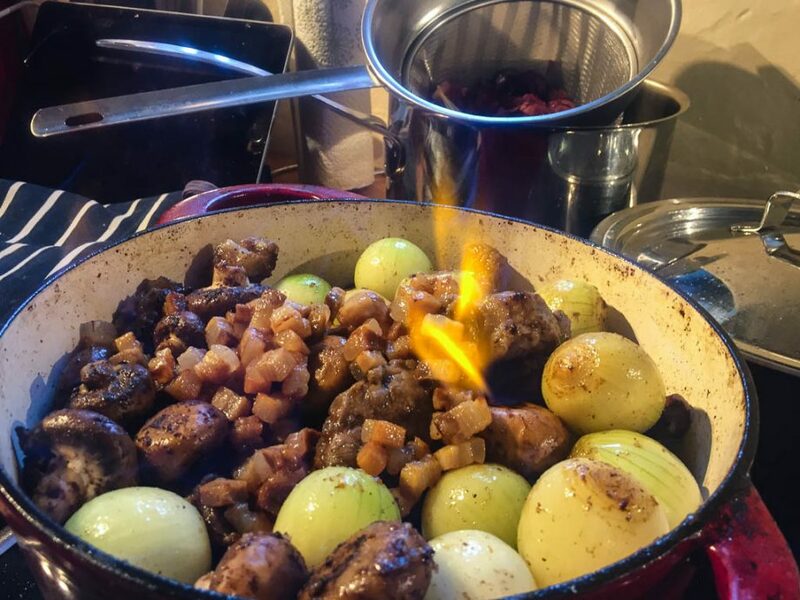 I have no idea what happened between the first waft I had and the final one, but some kitchen alchemy turned it into an unctuous aroma by the end of cooking. The pig’s foot was removed, so that was one thing dealt with. 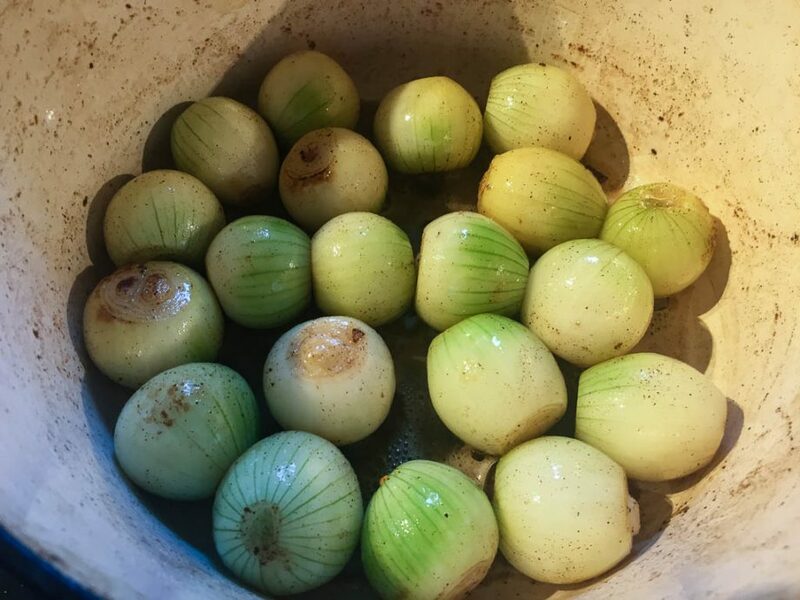 The onions had become sweet and very full flavoured in the slow cooking. The sauce, although surprisingly thin (I expected more of a gelatinous feel to it courtesy of the pig’s foot) was very tasty indeed. Full of flavour without being overpoweringly rich. There were mushrooms in it and some of the pancetta lardons (this book author/chef has a BIG thing for pancetta! ), all cooked well and a seamless part of the dish. The meat was falling apart tender, but the cut meant there was a lot of chewy fatty bits around each piece of meat and I don’t like that. I had to cut them all off. I can eat crisp fat, but not the rubbery stuff that’s been stewed for hours. All in all it made a very nice dinner dish. But the recipe could be tweaked to improve it in my opinion. Ah, I was wondering what happened to my lucky pig’s trotter! I’m glad that it’s been used in the commission of a splendid dish. 10/10 Greene (TM) points for this one (I had to withhold one bonus point due to my lucky trotter being used).